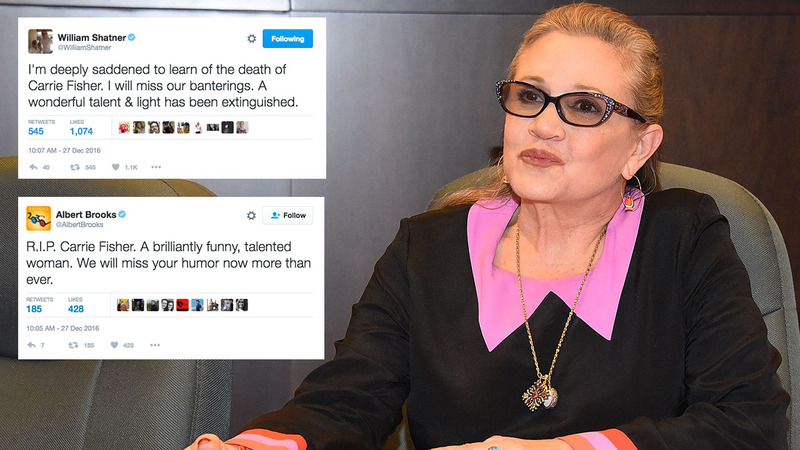 As co-stars and other celebrities learned of Carrie Fisher's death, they expressed their grief and remembered the actress who was immortalized as Princess Leia in Star Wars. Fisher died Tuesday at age 60. She had been taken to the hospital on Friday after going into cardiac arrest on a flight from London to Los Angeles. Her mother, actress Debbie Reynolds, thanked fans for their support. Mark Hamill, who plays Luke Skywalker in the Star Wars films, tweeted that there were no words to describe how he felt about the news. Later in the day, he sent out a longer reflection on his friend's passing. Harrison Ford, who plays Han Solo, said in a statement to ABC News that she is greatly missed. "Carrie was one-of-a-kind ... brilliant, original. Funny and emotionally fearless. She lived her life, bravely ... My thoughts are with her daughter Billie, her mother Debbie, her brother Todd, and her many friends. We will all miss her." In a statement, Star Wars creator George Lucas praised Fisher. "Carrie and I have been friends most of our adult lives. She was extremely smart; a talented actress, writer and comedienne with a very colorful personality that everyone loved. In Star Wars she was our great and powerful princess - feisty, wise and full of hope in a role that was more difficult than most people might think. My heart and prayers are with Billie, Debbie and all Carrie's family, friends and fans. She will be missed by all." More actors and members of the Star Wars family also paid tribute. Beyond the Star Wars universe, other notable figures expressed their grief and shared their condolences. So so sad to hear about Carrie Fisher. Thank you Carrie Fisher for my childhood.